ASTORIA STANDS at the mouth of the Columbia River, the only water level crossing of the Cascade-Sierra Divide. The destination of the 1803-1806 Lewis & Clark Expedition, the city is the oldest permanent American settlement west of the Rockies. Early railroads, however, favored the upriver ports that eventually coalesced into Portland. The closest rail line was the 1883 Northern Pacific main, the closest point of which ran from Portland north to the car ferry at Goble. Local efforts to create a rail link met continual funding problems. It wasn't until 1898 when the Astoria & Columbia River connected Astoria to the NP line, with trackage rights to Portland. In 1906, with an eye towards Astoria's potential as a port, James Hill acquired the A-Line as a feeder for his fledgling SP&S Railway. Construction of a bridge at Vancouver allowed the NP to switch over at that point, and the Goble line was then leased out to the A&CR/SP&S. HILL'S CLOSE ADVISOR, the engineer John F. Stevens, felt the line was not worth much for freight. Easily undercut by the "mosquito fleet" on the river, Stevens saw the line primarily as a passenger route. Indeed, at it's height, three passenger trains a day ran from Portland to Astoria, plus two trains on the Rainier-Portland run. One of the more distinctive runs were the so-called "Daddy Trains". These trains left Portland on Saturdays, carrying businessmen to spend the weekend with their families, who would often live the entire summer at the coast. Another passenger revenue generator was SP&S subsidiary Great Northern Pacific Steamship Company. It's two steamers connected Portland trains to San Francisco, with a total run only three hours longer than the SP's express over the Siskiyou Line. BUT PASSENGER TRAFFIC, though large, was not always profitable. The steamers were never well patronized, and the ships were sold on the eve of WW1. The Astoria-Seaside steam run was replaced by a Mack railbus, and then completely dropped by 1921. With parallel highways being paved, jitneys were inroading into profits. To try and stave this off, the SP&S started it's own bus line. The "Rainier Skunk", which had operated from Portland to Rainier since 1915 with a GE doodlebug, was replaced by a bus in 1924. But buses, in the face of more private auto ownership, also began to decline, and in 1942, the bus line was sold. The "Daddy Trains" ceased running in 1939. WW2 boosted ridership somewhat, but passenger service was on a steady decline. The remaining passenger train, 21/22, consisting of an express car, an RPO baggage, and a single coach, was deiselized with an F3 in 1948. But just four years later, the run was terminated. The A-Line had always been popular for excursions. During the 1930s, the Oregon Journal sponsored runs to Seaside. NRHS sponsored runs over the line in the 1960s, and again in 1990, the last behind BN GP38-2 2075, one of the Pacific Pride units. When passenger traffic ceased, the A-Line became a low density, resource based branchline. The bridge over Young's Bay became history, and the line to Seaside ceased to be. A mudslide at Aldrich Point closed the line beyond Clatskanie in 1996, and brush began to grow in the right-of-way. 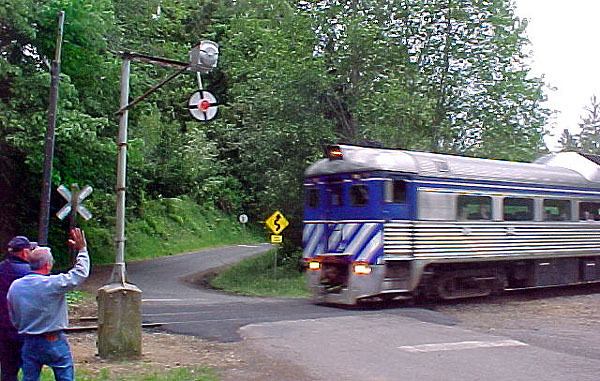 In 1999, Portland & Western, a GWI shortline operating in the Willamette Valley, purchased the A-Line. But, lacking industry or significant port facilities on the lower line, the slide remained, blocking the way to Astoria. AS THE YEAR 2000 approached, thoughts across the nation turned to the impending bicentennial of the Lewis & Clark expedition. Astoria, positioned at the end of the trail, worried about the tourist traffic the bicentennial would put on US 30. Searching for an alternate transportation mode, the idea that would become the Lewis & Clark Explorer was born. And the idea grew, and took physical form. In late 2001, Congress appropriated $2 million to rehabilitate and reopen the line. The Aldrich Point slide was shoved aside, and soon enough, every third tie or so from Clatskanie westward was being replaced. BC Rail was then exiting the passenger business, and the Oregon DOT snapped up three of their Budd RDCs for a good price, for future use on the line. Rapidly everything seemed to be falling in place. The Budds arrived in Portland, rumors of the new service began to fly across the internet, and then, in mid-March, Amtrak began to offer tickets on the new train, christened the Lewis & Clark Explorer. JUST AS ASTORIA WAS POISED to see it's first revenue passenger train since 1952, word began to trickle down from DC that the Explorer would be canceled. In the middle of a budget battle on the Hill, Amtrak CEO David Gunn was worried that the trains, seasonal though they were, would violate his "no new trains" policy, and make his job harder. The passenger carrier withdrew abruptly, and threatened to refund all tickets that had been sold. ODOT Scrambled. Frantic backstage work with DC kept the latter disaster from occurring, but operations were still an issue. But where would they operate from, and who would crew the trains? On the eve of disaster, Portland & Western, the host railroad, stepped up the the plate. DUE TO THE WITHDRAWAL of Amtrak, the trains would have to start from an industrial siding in Linnton, some miles north of Union Station. Passengers who chose to depart from the depot were shuttled to the trains in a chartered Tri-Met bus. At Linnton, the equipment for the day, Budds 10 and 11, basked in the early sunlight, surrounded by boarding passengers. Budd 31, originally the Great Northern's only RDC, sat forlornly a few carlengths away. It had had gearing trouble on the VIP run the previous weekend, and additionally, would not be needed in order to accommodate today's run of about 90 passengers. The equipment had had it's pilots shaved, in order to clear some high crossings encountered on a test trip. All this last minute scrambling had left the ODOT crews tired, and with no time to properly apply any decals. As a result, the units left Linnton lacking their Lewis & Clark Explorer marking, and still wearing their BCR colors. With about 90 of 120 seats filled, the run was well patronized, although amazingly there were few railfans evident. Service on board was impeccable, and the experience was more akin to the classic Pullman era than modern Amtrak. A leisurely four hour run out, and four hour run back, gave plenty of time for the passengers to relax in the deep reclining seats, and soak in the experience of train travel. The operation encountered only one hitch on it's first day. On the return trip, the train had reached the deck swingspan at the John Day River, only to discover it would not close. Passengers clustered nervously behind the lead door, peering out the front door window to watch the crews struggle with the crank. Although the delay was worrisome, it was not so for the reason that might be expected; the chief worry was that the train would go back to Astoria and the passengers bussed home. PNWR crews, however, were determined not to take this route. An hour plus later, the bridge was aligned, and the train was on it's way back to Portland. Although the arrival at Linnton was well over an hour late as well, no one complained. If anything, it was an event that bound many passengers to each other, and had only made the trip all the more memorable. THE FUTURE OF THE RUN is not so assured, however. Funding for operations seems to be stable at the moment, according to recent reports from ODOT. However, with budget uncertainty hanging over the train in Salem, it can be difficult to build a decent following. Indeed, the first run was not sold out, though it was anticipated that it would be. On the bright side, the Oregon portion of the Bicentennial is still ahead in 2005, so the tourists the operation is aimed at are still ahead. Meanwhile, ODOT considers the equipment a wise investment. The RDCs were acquired at a good price, and were in better shape than early reports had indicated. Additionally, there are a number of alternate potential uses for the equipment. One that recently came up was the possibility of replacing the Talgo equipped Cascades to Eugene with the RDCs, as they would be more suitable to the ridership numbers, and would be cheaper to operate. Another is the still planned Washington County Commuter Rail project, for whom the equipment would be a perfect fit. INDUSTRIAL COMPACTION, shipping changes, economic slumps and crashes, demographic shifts and mudslides: all contributed to the demise of Astoria's place on the rail map. Whatever the specifics of the Budd's disposition, at least for now, Astoria has beat all the odds, and fifty-one years after it's last run, passenger trains once more grace the rails where the nation first became a transcontinental power. Portland area resident Alexander Craghead is the Editor and Webmaster of NWOR. A member of the Spokane, Portland & Seattle Railway Historical Society, he can be reached at abcraghead@earthlink.net. Additionally, he would like to thank Martin Adams, Claudia Howells, Mac McGowan, and Arlen Sheldrake for help with this article.